New Delhi: Saudi Arabia on Wednesday announced that it will invest $100 billion in India, MEA spokesperson Raveesh Kumar said. 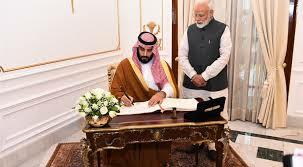 “Big announcement – Saudi Arabia to invest $100 bn in India – a huge vote of confidence in the Indian economy,” Raveesh Kumar tweeted. Kumar further said that Prime Minister Narendra Modi welcomed the announcement by Saudi Crown Prince Mohammed bin Salman. Saudi Arab will invest in areas like energy, refining, petrochemicals, infrastructure, agriculture and manufacturing. Welcoming Saudi Arab’s entry into the International Solar Alliance, the Prime Minister stated that the ties between two countries for cooperation on energy sector should also be taken to the level of ‘strategic partnership’. Saudi Arabia condemned in the strongest terms the recent attacks in Pulwama in Jammu and Kashmir. “India and Saudi Arabia called on other countries to denounce terrorism as a state policy, cut off support and financing from all territories. Both leaders underlined comprehensive sanctioning of terrorists by the United Nations,” the MEA spokesperson said.